We live in a time of rapid change and disruption where it isn’t enough anymore to merely react to risks when they occur. Business success depends on an organization’s ability to look ahead and be more proactive in terms of understanding emerging risks and their impact on the business. This approach, known as forward-looking risk management, can help the organization adapt quickly to risk events, limit risk exposure, and save costs. 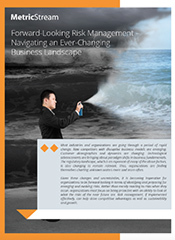 What constitutes forward-looking risk management?